How much is Rishi Kapoor Worth? Rishi Kapoor net worth: Rishi Kapoor is an Indian actor, film producer and director who has a net worth of $40 million. Being the second son of director and actor Raj Kapoor, Rishi made his acting debut with his father's 1970 film Mera Naam Joker, where he played Young Raju. Kapoor landed his first title role opposite Dimple Kapadia in the 1973 blockbusting movie Bobby. Then he made a popular pairing with his wife-to-be Neetu Singh in films like Khel Khel Mein, Kabhie Kabhie, Amar Akbar Anthony. Rishi Kapoor got solo lead hero roles in 51 movies, out of which only 11 turned out to become box office hits. Apart from the above, he was often offered roles of a younger brother of the main lead heroes in multi-hero movies, where his romantic character would have a life story closely revolving around the one of the lead hero. In the 1990s, he appeared in hit movies like Henna and Bol Radha Bol, and played the main lead hero in multi-hero films such as Deewana and Damini – Lightning. After performing in several box office failures from the mid 1990s, he moved on playing supporting roles in the 2000s. In 1999, he directed the drama Aa Ab Laut Chalen, while in 2000, he played romantic lead for the last time in Karobaar: The Business of Love, which had a 5-year-delayed release. Ever since he has been playing supporting roles in movies like Yeh Hai Jalwa, Hum Tum, Fanaa, Namaste London, Love Aaj Kal and Patiala House. He also appeared in 2 British movies and had a chance to play himself in the 2009 Ranjit Kapoor's directed movie Chintu Ji. In 2012, he played along his brother Randhir for the first time in Housefull 2. 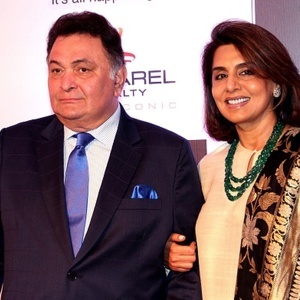 In his personal life, Kapoor maried actress Neetu Singh in 1981 and they have two children together: actor Ranbir Kapoor and designer Riddhima Kapoor Sahani.